Coaching is a powerful way to create structure, awareness, momentum and action for change. It’s not about having a conversation or talking hypothetically. It’s about being very intentional and looking inside yourself with laser-sharp focus. It’s about honoring the longing and hunger for a more fulfilling life. It’s about asking yourself the really hard questions and truly listening to the answers. Trish M specializes in life coaching, faith-based coaching, success coaching, spiritual growth and personal development coaching, and relationship coaching (Engaged, Divorced, In-waiting). Coaching with Trish M is an ongoing professional relationship to get you moving from where you are to where you want to be. It’s about present and future; it’s goal oriented; it’s action oriented. The transformation, elevation and results happen over time. However, if you are in a place and feeling the need or nudge to move and you need a right NOW resource for clarity, direction or breakthrough, then coaching with Trish M is the way to go. If you’re ready to get unstuck, get focused, get balance, get moving, get living, get happy, get over and get on with your life, then Trish M is ready to get started with you today. If you are in need a sounding board for turnaround but you don’t have a coach, mentor, advisor or subject matter expert, this would be a FABULOUS first step for you. • Discover your true creative calling and purpose. • Set specific long-term and short-term goals for your life, business, ministry, etc. • Become aware of your thoughts and behaviors to get to know yourself fully. • Dig down to the root causes of the fear, anxiety, doubt, and self-sabotaging habits that are stifling your creativity, and release them permanently. • Plan effectively so you can take the right actions to achieve those goals. • Make career decisions that satisfy you because they are rooted in your core values. • End your procrastination by focusing on one task at a time so you don’t compromise your artistic essence. Don’t put off tomorrow what you can get started today! 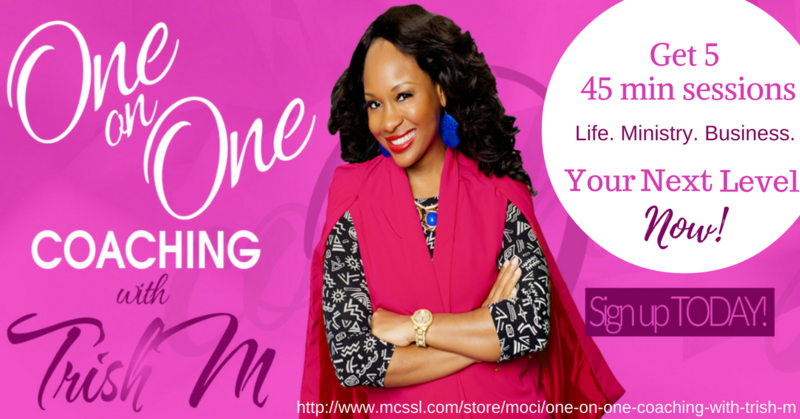 Sign up for your 1 on 1 coaching with Trish M NOW!!! 1 easy payment of $297 or 2 easy installments of $155 (interest included)! Click the button below to SIGN UP TODAY!